When you're ready to make a change to your interior design, one of the most dramatic moves you can make is to install custom wall murals to dress up an entire room, or just a single wall. 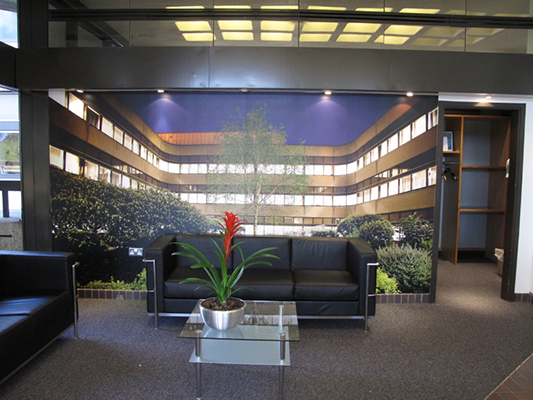 Phototex digitally printed wallpaper makes it easy to design, order and install your a custom wall mural. GD Print is a premiere suplier of self adhesive wallpaper in the UK. Phototex has established itself as a leading brand of self adhesive wallpaper in the wallpaper mural industry. Often referred to as “Wall Covering” by the discerning digital printer and designer. Phototex is easy to use due to its patented and unique low tack adhesive. The patented adhesives’ water resistant characteristics provide flexibility as an internal and external Wall Covering. The textile/fabric material of Phototex makes it exceptionally easy to use and hang; wrinkle free. If there is a wrinkle, simply pull back, reposition and re-apply. Once you’re ready to remove Landor Phototex it is 99%+ residue free, leaving the wall ready for the next wall covering unlike traditional wallpaper stripping. Removing Landor Phototex is as quick as pulling a corner and pulling it down. Phototex self adhesive poster media has a unique re-positionable adhesive that can be re-applied time and again without leaving any sticky residue behind. This incredibly durable, polyester blend, poster media will not rip or wrinkle and can be removed and re-positioned without damaging the host wall. The fine texture of this media delivers high quality images and it can be back lit with stunning results. Fire retardant- This polyester blend poster media is fire retardant up to 450 C and is self extinguishing. Can be removed and re-positioned - Phototex poster media is removable and repositionable and will stick to any non-porous surface such as walls, windows, doors or floors and can be easily applied to curved mounting surfaces. It can be re-positioned and will not peel the paint from a wall, nor will it damage wallpaper when placed over it. Waterproof and suitable for outdoor applications- Can be used in areas of high moisture indoors such as bathrooms, spas and swimming pools - we always recommend applying liquid laminate. Phototex has been tested with liquid laminate for over 6 months in a shower and it is still stuck as though it was the first day. GD Print has a team of wallpaper fitters available to install your self adhesive wallpaper anywhere in the UK. Or, we will supply your high-quality custom wallpaper, if you have your own fitters already available.